This set of push-up stands will help you bring your workout to the next level so you can work your abs, chest, triceps, arms, and shoulders. The push-up handles provide you with a more even weight distribution as it lowers the pressure and strain put on the wrists. Also, the rotating handles and non-slip pads make it easy to do a number of different types of push-ups. Push-ups include: the traditional push-up, beginner push-ups (on knees), 2 hands on one bar static push-ups, leg lift push-ups, mountain climbers, and 1-armed incline push-ups. Please be sure to use on exercise mat or carpet for best grip. PORTABLE AND LIGHTWEIGHT: Pushup grips are 3.5 inches tall with a 8 inch diameter, making them ideal to take with you as you travel or store in a gym bag. AMPS UP YOUR WORKOUT: High-intensity push up handles will help define your abs, shoulders, arms, chest and triceps by keeping your muscles engaged so you can receive fast and effective results. EASY ON THE WRISTS: Fitness handles are easy to grip and helps distribute your weight for a more neutral position, allowing you to target more muscle groups in body. 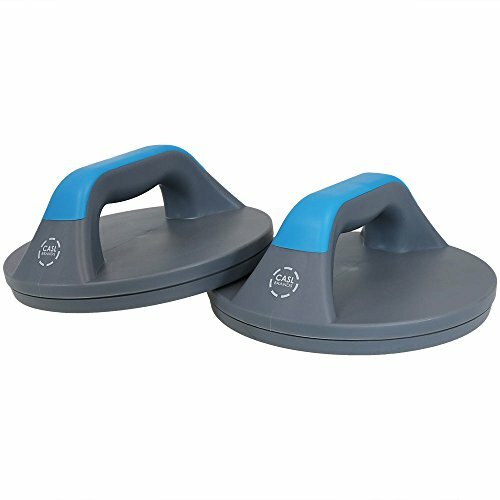 STABLE AND EASY TO USE: Nonslip pads on the bottom make for easy use on carpet, exercise mat, or any other type of floor.